Today we saw the ouster of yet another of Donald Trump’s personal allies from the White House, when former Apprentice contestant Omarosa was fired. Her job in the White House was a joke, and she did nothing. As we explained earlier), the controversial nature of her departure looks like it may have been mutually staged. But nonetheless, General John Kelly has managed to dispense with yet another of Trump’s pals. It’s time to start asking why, and it’s time to start looking at the bigger picture when it comes to Trump’s other allies that aren’t truly allies. Anyone who has been paying close attention has been able to see that Trump’s personal attorneys in the Russia scandal aren’t really playing on his team. They keep telling him that the investigation is almost over, and that Special Counsel Robert Mueller isn’t even really investigating him. They’re misleading him because they know its what he wants to hear, which means they’re not even bothering to put him in a position to help understand his own best defense options. They’re either doing this because they just want to get paid, and they figure it’s the best way to remain on the job for as long as possible, or because they truly believe Trump should be ousted. This seems incredible: the personal attorneys for the “President” of the United States are misleading him in a scandal that’s going to end his presidency and ruin his family, and he can’t figure it out. Yet all the evidence says that’s precisely what’s happening. 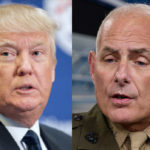 If Trump is that far removed from coherence or reality, it’s very easy to believe that John Kelly might be getting away with doing the same thing to him, and perhaps for the same reason: Kelly thinks Trump is unstable and wants him ousted. So let’s look at what Kelly has done here. Upon taking the White House Chief of Staff job, Kelly immediately began ousting every adviser Trump personally liked: Anthony Scaramucci. Steve Bannon. Sebastian Gorka. And now Omarosa. These were Trump’s jesters, the ones he talks to, the ones he seeks advice from, the ones he likes and trusts. They’re all gone. Other than perhaps Kellyanne Conway, it’s no longer clear that Trump has anyone in the White House who’s truly on his team (the way things are playing out with them, Ivanka and Jared no longer count). That may be the point. John Kelly has managed to physically separate Donald Trump from all the people he likes to rely on, the personal allies who have probably been doing the most to keep him upright as everything else continues to fail for him. Kelly hasn’t stopped Trump from continuing to post self-defeating tweets. Kelly hasn’t tried to reel in Trump’s racism, and has instead seemingly tried to steer Trump further in that direction. The case can be made that Kelly isn’t doing anything to improve Trump’s prospects; all he’s done is to isolate Trump from his own people and make him even more miserable and less able to function. Perhaps John Kelly is merely incompetent at this job. It’s difficult to imagine anyone being particularly competent at the task of turning a mentally unstable buffoon into a successful President of the United States. But if Kelly’s goal has been to help Trump succeed, he’s consistently failed in stunning fashion, and in fact has marched Trump closer to catastrophic failure and thus closer to ouster. It’s time to ask if Kelly might be doing it on purpose, because he knows better than anyone that Trump is a mortal danger to the United States of America.